Chinchilla are back with their follow up to The Last Millenium. My expectations for this album were quite high as The Last Millenium was an outstanding slab of melodic metal. I feel that Madtropolis falls slightly behind their previous album, although I will admit that Chinchilla set the bar pretty high with that album. Don't get me wrong, Madtropolis is actually a very good album, just not an outstanding album like The Last Millenium. After an introduction, the album kicks off with three killer tracks that pick up right where the previous album left off. Our Destiny, A Dance With The Devil, and When the Sand Darkens the Sun are all powerful tracks, yet melodic and addictive as hell. Majestic chorus lines, tasteful use of keyboards, and the lead vocalist of this band are the most important highlights of this band. The singer sounds much like Tobias Sammet, as his voice is very emotional and melodic. He doesn't posses the impressive range of Tobias, but there is no doubt that Tommy Laasch adds a lot of color to each and every song. Of course, we are still treated to strong riffing throughout the album and a host of songs than manage to crawl into your memory, not to be forgotten any time soon. Unlike its predecessor, Madtropolis contains a couple of weaker tracks. The most obvious example is the song simply called Heavy Metal. Yes, the lyrics to this song are just as cliché as the song title itself. That's too bad since the song is actually pretty nice from a musical standpoint. Entire World and Turn Around the Magic Table are mid tempo tracks that simply don't have the same impact as the uptempo cuts. Somehow, they seem very ordinary (not bad though) when stacked up against the three opening tracks, or other catchy metal anthems such as Money Rules Everything and the title track. Chinchilla has a talent for combining emotion, power, and melody as demonstrated by their uptempo tracks. However, I'm not nearly as impressed with the mid tempo numbers. Despite my gripe regarding the average sounding mid tempo tracks, the band proves they can write a killer ballad with Satellite. Aside from these few bumps along the way, the majority of this album is the same quality melodic metal that we have come to expect from this band. I still think the band could use a bigger production, but I am certainly satisfied with what I hear. 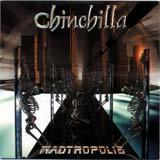 Madtropolis is certain to please fans of Chinchilla, although I would place it a small step behind their last album. As I said, there are just a few songs that dent the steady flow of this album, but the remaining tracks more than justify the acquisition of this album.